As you may have gathered from recent posts, I’m ever so slightly excited about the very first Wells Food Festival, which takes place this coming Sunday. One of the many reasons I’m looking forward to this culinary extravaganza is the festival also marks the opening of a brand new foodie establishment in Wells. Locals might have been wondering what’s been happening to the Sun Inn over the last few weeks. The pub on Union Street has been closed a little while and is currently being refurbished and transformed into a Greek idyll. Just in time for the festival, the pub will reopen as The Greek Taverna at the Sun, and as a big fan of Greek food I for one cannot wait. I lost no time in catching up with the Sun’s new owner, Olga, who will be running the pub with her brother Yianni, to find out more about their plans. “It is very much a family business,” Olga explains. “We want our customers to feel like they have just been invited to our house for a meal. Our mother will be the main cook because of course no-one cooks like a Greek mum! We believe that food is not just about what you cook, but that it always tastes better when you can enjoy it in a friendly, relaxed environment. Olga’s mother had her own restaurant back in Greece for over seven years, while Olga and her brother Yianni have run a small boutique hotel together. They clearly have heaps of experience, but what brings them to Somerset? How does Olga think Wells will respond to their Greek food? Why is she so keen to share Greek cuisine? “We love Greek food, not just because we are Greek, but also because we believe it is simple, healthy and delicious,” replies Olga passionately. “We know that British people love Greek food but what they get most of the time in the UK is Greek food cooked in a British way. We will be cooking authentic Greek food using local ingredients; we believe food tastes better if ingredients are sourced locally. Somerset has many farms producing excellent fruit, vegetables, meat and dairy. To give you an example instead of buying sausages imported from Greece, we decided to give our traditional family recipe to one of the local sausage producers who will be making them just for us. I asked Olga if she could give us a taste of the kind of food we can expect to find at the new Sun Inn, and she has very kindly provided her recipe for Zimaropitta. “Because your blog is about lovely, tasty food that doesn’t take long to prepare, I thought we can make an easy pumpkin pie with feta cheese,” says Olga. “Simple, inexpensive ingredients you can mix together in one bowl and cook in the oven is my idea of healthy fast food. This is what this recipe’s all about. We used a marrow bought straight from the producer in Wells Market and local Somerset feta cheese from Queen Street Deli. 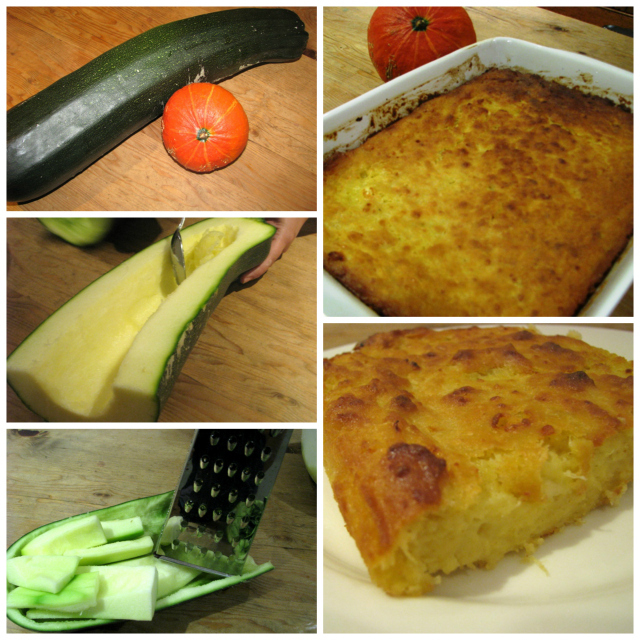 The traditional Greek way of grating a pumpkin or a marrow is to cut it in half lengthways and use a spoon to scrape off the soft part little by little. Of course, it might be easier just to cut it to pieces, peel and use a box grater. Then mix all the ingredients in a bowl and add some water if you think it is needed. It should have a thick, porridge-like consistency before you pour it into a buttered ovenproof dish. Bake in a preheated oven for about 45 minutes to 1 hour. Thanks so much to Olga for her delicious recipe. I can’t wait to give it a go myself, as I know this is just the kind of thing my family will adore. I wish Olga, Yianni and their mum every success with their new venture and look forward to seeing the newly refurbished pub when I come over for the festival at the weekend. If you’d like to keep up-to-date with what’s happening at the Sun Inn, do visit their Facebook page. And if you’d like to find out what else is happening this Sunday at the Wells Food Festival, take a look at the website at www.wellsfoodfestival.co.uk. Congratulations to Maxine – the winner of the Kitchen Nomad giveaway I ran all the blog last month. 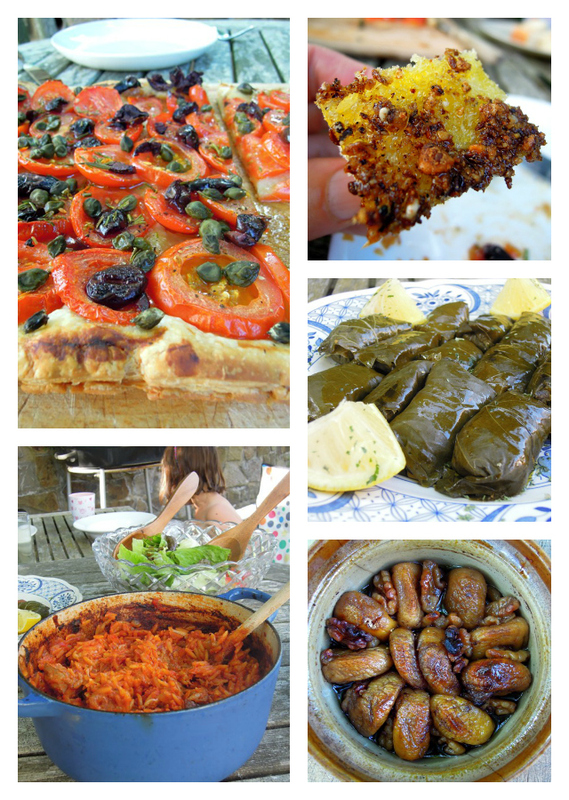 Maxine will be the very lucky recipient of a delicious Greek hamper full of authentic ingredients to get her started on a wonderful Greek food frenzy, including dolmades, youvetsi, olive and tomato tart and baked figs. My mouth is watering remembering all those fabulous dishes! Maxine, you’re a very lucky woman – I hope you enjoy your food box! The weather has been so wonderful here for the last couple of weeks. It really has felt like we’ve been on holiday in our own home – spoiled only by the annoying need to go into work. Even so, with beautifully warm and balmy evenings, I haven’t really felt like I’ve been missing out. Much. Last weekend, it wasn’t too difficult to imagine ourselves on holiday on some stunning Greek island. There is something very special about being in the UK and being able to spend all day long outdoors, especially eating al fresco. OK, we had to make do with a paddling pool instead of clear turquoise seas and we drank Somerset cider in place of retsina. But at least the food was authentic. 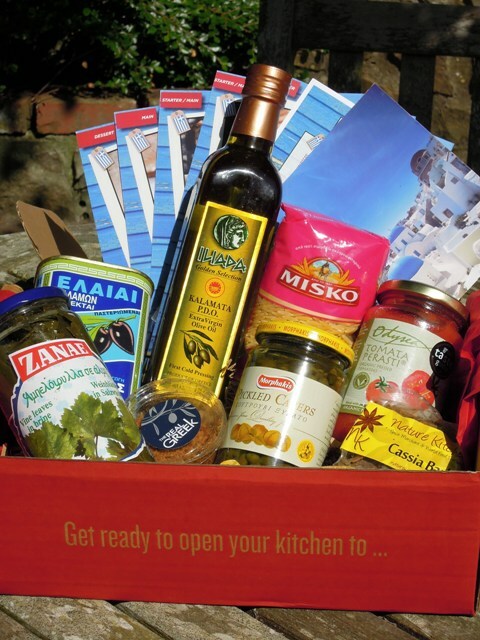 I was lucky enough to have been sent a delicious food box from Kitchen Nomad to review, full of carefully selected, speciality Greek products providing the basis for five inspiring recipes developed by Tonia Buxton of My Greek Kitchen. Kitchen Nomad is a new subscription food box service offering the best in world cuisine delivered monthly. It’s the brain child of three friends, Clara, Fanny and Bryn. Each month, they select a different country of the world, carefully source authentic products and typical recipes of that country, pack it all up in a beautiful box and deliver it right to your door. It’s an ingenious way to discover world cuisine and cook new recipes in your own kitchen. Fanny and I are really close friends. We met in Lille, France, seven years ago while studying at Business School. We travelled a lot together and were always excited about discovering new cultures and …. new food! After graduation, Fanny went to London and I went to Paris to start our careers. In London, Fanny met Bryn (they worked at the same place) and they quickly realised how much they had in common, especially food and travel! Bryn and Fanny currently work as project managers in banking in London, and I live in Paris, working in marketing for a company dedicated to sustainable development services. So here you have three young entrepreneurs, passionate about travelling the world and experiencing new culinary discoveries. When returning home after travelling, we noticed how difficult it is to find all the products and recipes we need to cook some of the amazing meals ourselves that we tasted on our travels. Also we wanted to share all the delightful things we have experienced on our travels, and that’s how Kitchen Nomad was born! 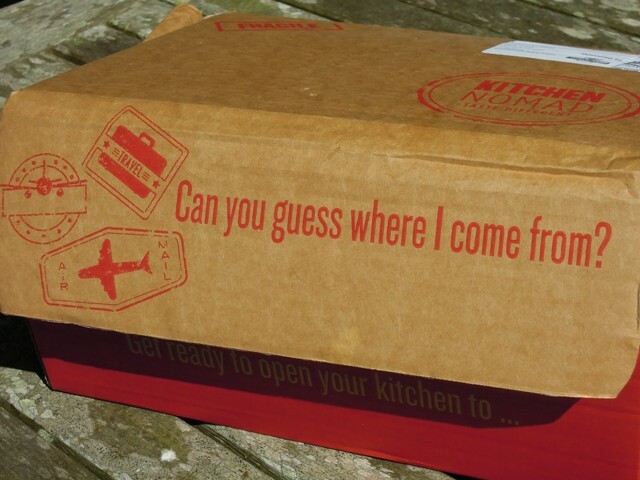 So what did we receive in the first Kitchen Nomad food box? Dukkah spice mix – a tasty spice dip perfect with a little olive oil for dipping big chunks of bread. Originally from Egypt, this is the Greek version, as adapted by the Real Greek Restaurant. Pickled capers – intense and mustardy, I had to lay down the law with my oldest daughter Jessie to stop her from eating the whole lot straight from the jar! Dried Greek figs – while I love fresh figs, I’ve never really been one for the dried variety, but I had to lay down the law with myself to stop me eating all of these sticky, chewy bad boys before they made it into pudding! 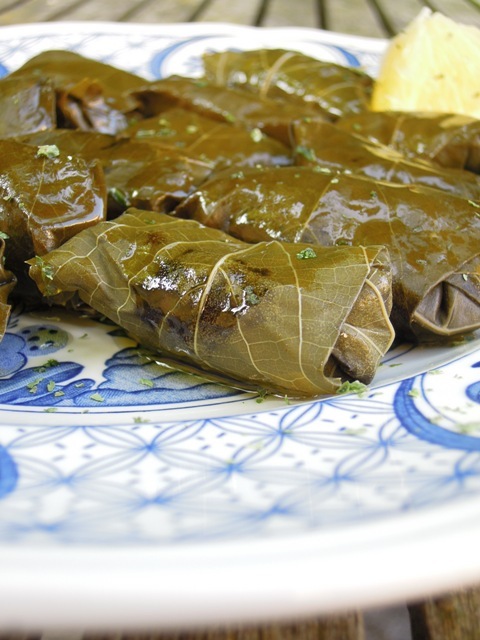 While I know I love dolmades, I really wasn’t sure how the children would take to them. I was rather surprised to discover they loved them too. Perhaps it’s because they’re such neat little bite size parcels – perfect finger food for little ones. Admittedly they take a little time to prepare, but they’re not difficult and it’s really quite a tranquil, almost meditative activity, particularly since the children scarpered super quick from the kitchen when I suggested they lend a hand. This one pot dish is something I’m going to cook again and again. And again. It’s just so good. 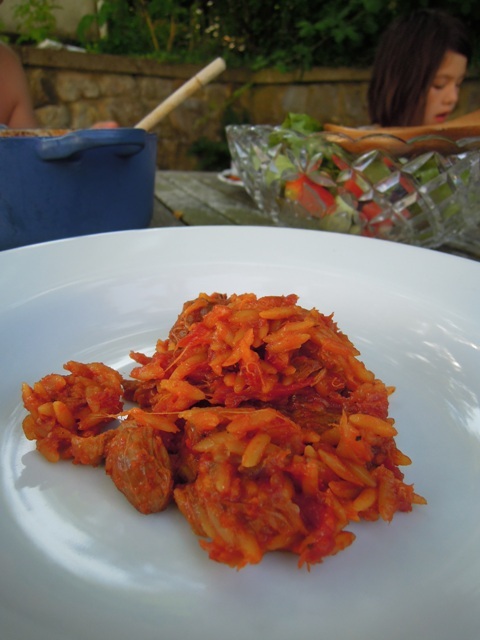 The whole family wolfed down the slow cooked Youvetsi. The cassia bark gives it such a warm, slightly sweet and aromatic flavour, it’s really hard to say no to seconds. Or thirds. Incredibly easy to make, my children took to calling this tart a “Greek pizza” but without the cheese. The Kalamata black olives really were the making of this tart. We’re enjoying working our way through the remainder of the tin. 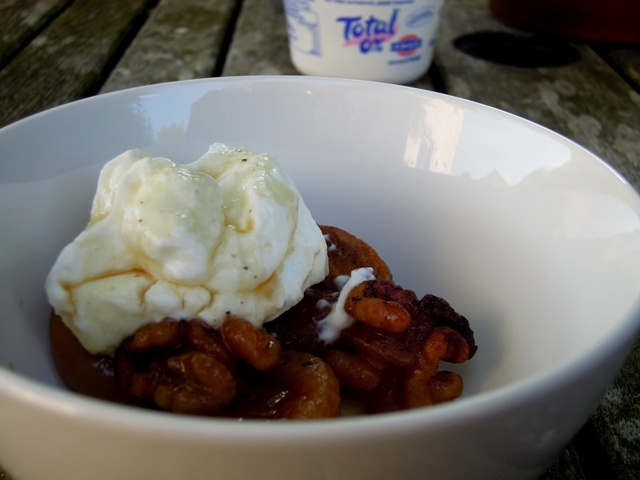 And another ridiculously easy dish, this fig and walnut bake is perfumed with a light syrup flavoured again with cassia bark, and it is just downright gorgeous served with a big dollop of creamy Greek yoghurt. We’d have enjoyed the leftovers for breakfast the following morning, but there weren’t any. So what’s my verdict on the Kitchen Nomad food box? Well, quite simply, I love it. At first I thought it might be a little on the expensive side, since you have to shop for all the additional fresh ingredients. But these dishes could easily have provided us with three or four days worth of meals – we were just greedy and went for it over one weekend. Each box costs £22 (plus delivery), but if you sign up for a minimum of six months it drops to £21 a month, and for a year it goes down to £20 a month. It’s about more than the produce you actually receive. It’s about the thought that goes into the boxes, the recipes you’re supplied with and the knowledge and passion that goes into them, and the tips that are passed on. And it’s about the adventure and excitement and mystery too, because you have no idea where in the world you are going next. I’m sold and I’m signing up. Especially since I’ve seen the next box has a Vietnamese theme – a cuisine I’m not all that familiar with but am keen to try. If you’d like to try a Kitchen Nomad food box yourself, here’s your chance. Clara at Kitchen Nomad has very kindly offered one Bangers & Mash reader the opportunity to win a box. Simply leave a comment below by Saturday 3 August letting me know why you’d like to receive a Kitchen Nomad box and you could be in with a chance of winning. Good luck! Disclosure: Kitchen Nomad sent me a complimentary Greek food box for review purposes. No money exchanged hands and all opinions expressed are entirely my own. Generally in January I yearn for rib-sticking, stodgy, winter warmers; the kind of hearty, satisfying food that provides an extra layer of insulation against the cold and damp outside. But occasionally I find myself craving sunshine food; dishes that remind me of blue skies, eating al fresco and the scent of honeysuckle. And this slow roasted pork does exactly that. 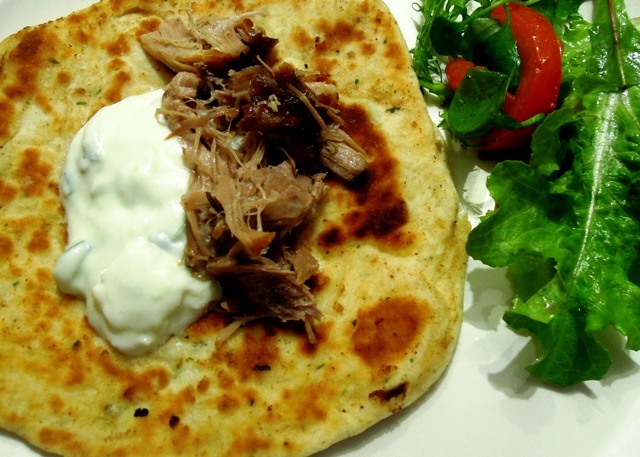 The sweet, fragrant and tender pork neck is shredded and served simply with flatbreads, salad and tzatziki, very reminiscent of incredible gyros we enjoyed on holiday in Kefalonia last summer. Pork neck is a very cheap cut of meat but you’ll probably need to ask your butcher for it. Ours doesn’t have it out on the counter as it’s not all that popular; he normally uses it in his sausages. But it is perfect for slow cooking – so delicious and full of flavour, especially when you marinade it in plenty of herbs, garlic and lemon juice. Don’t be tempted to rush the roasting. 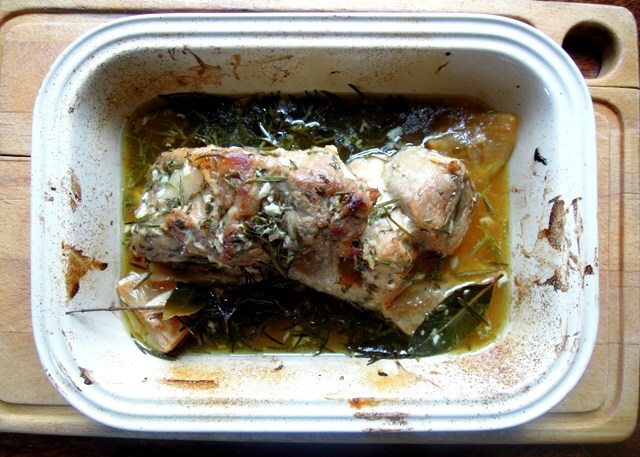 For a wonderfully succulent texture, the pork neck will need around four to five hours in the oven. Preheat the oven to 200°C/gas mark 6. You begin with a high temperature to get it started and then whack it right down low to slow cook. 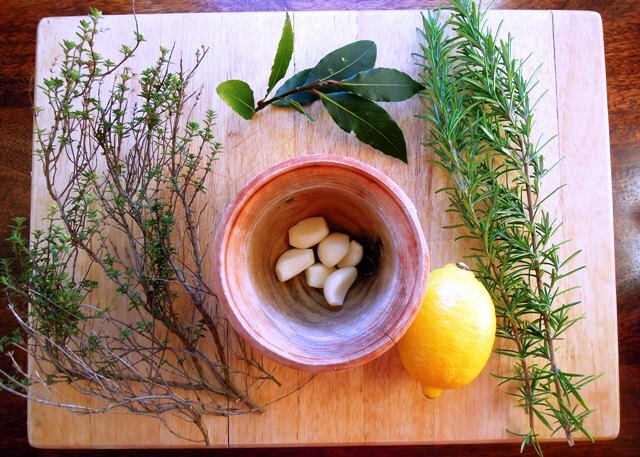 Using a pestle and mortar, roughly crush the garlic cloves with the thyme, a handful of rosemary picked from the stalk and the juice of half the lemon. 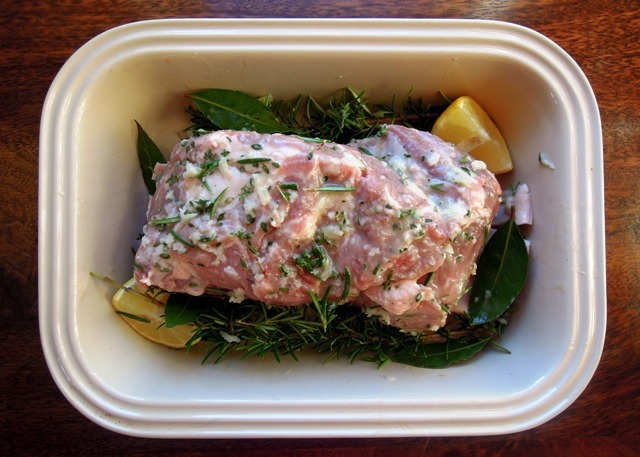 Put the piece of pork into a medium-sized ovenproof dish, pierce all over with a sharp knife and rub all over with the garlic and herb mixture so it penetrates the flesh. After 15 to 20 minutes, just enough time to really get the meat hot, turn the temperature down to 140°C/gas mark 1, or the middle of the simmering Aga oven. Roast for four to five hours until the meat is tender and beginning to fall apart. Remove the foil and increase the temperature to 200°C/gas mark 6 (back to the top Aga oven) again for another 10 to 15 minutes to brown the pork a little. 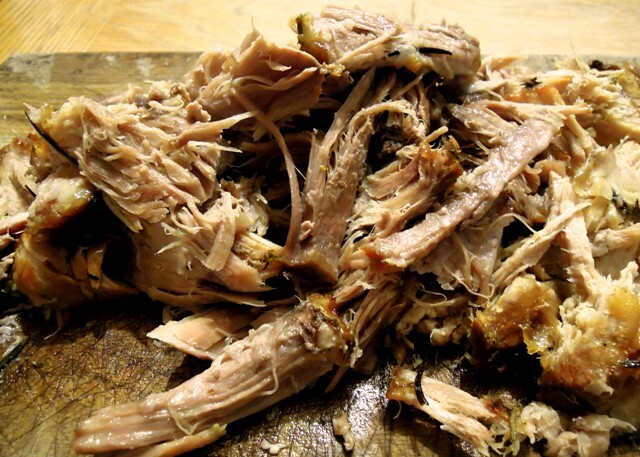 Shred the pork using a couple of forks and pile onto a large serving plate. Bring to the table with a simple salad, tzatziki and a stack of warm mint flatbreads (below). 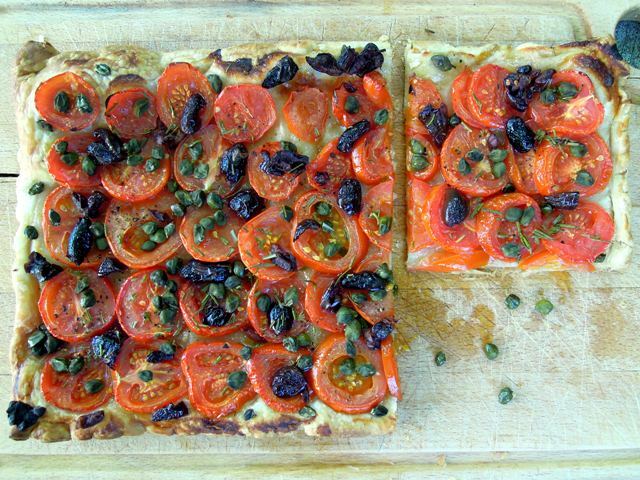 These flatbreads were inspired by a Yotam Ottolenghi recipe in his wonderful book Plenty. 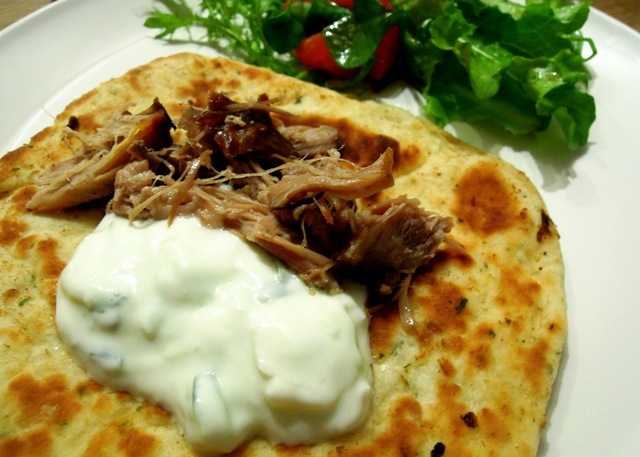 I’ve swapped coriander for mint, which perfectly complements the Greek-style pork and yoghurt. Place the flour, baking powder, salt, yoghurt and mint in a large bowl and mix together to form a dry dough. Add a little more flour it it’s a bit sticky. Knead the dough for a couple of minutes until it is smooth and stretchy. Wrap the dough in clingfilm and chill in the fridge for an hour. Divide the dough into 10 to 12 pieces, form into balls and then roll with a rolling pin into round discs about 2mm thick. Heat a knob of butter and a little olive oil in a large, heavy-based frying pan over a medium heat and fry the flatbreads, one at a time, for a couple of minutes on each side until golden brown. Add a little more butter and oil as required. Keep the flatbreads warm until you’ve cooked them all. Enjoy with your slow roasted pork! As this dish features lots of lovely herbs, I’m entering it into Lavender & Lovage’s Herbs on Saturday recipe challenge, which I also happen to be hosting this month!